At The St. Regis Maldives Vommuli Resort, we invite guests on an exquisite epicurean journey. Our culinary experts showcase their exceptional talents by crafting worldly dishes using fresh seafood and locally grown produce as well as serving top-shelf libations in an array of sophisticated settings. 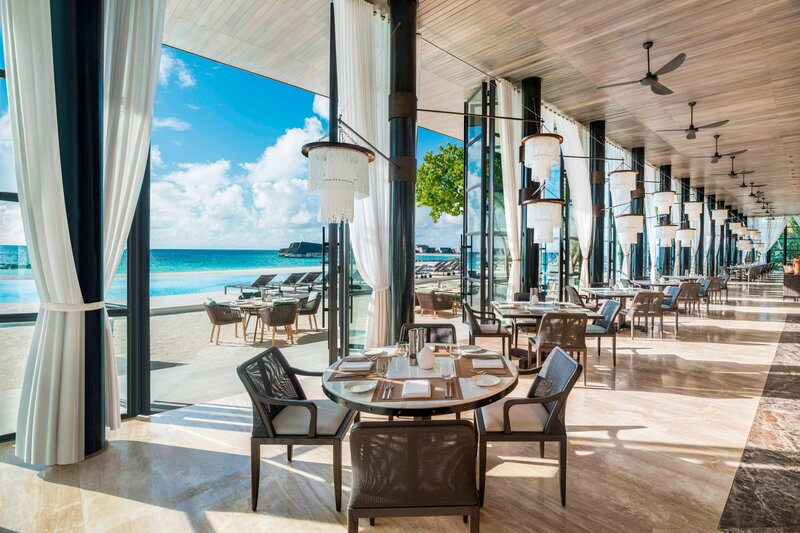 Fresh sea breezes waft through the floor-to-ceiling windows of our signature restaurant, Alba, where guests are invited to savor delectable Italian cuisine while taking in enchanting ocean and pool views from our airy open kitchen or our enchanting terrace. Meanwhile, the venerable Decanter promises a five-course degustation menu paired with seven complementary vintages hand-selected by our professional sommeliers. Opening directly onto our pristine beachfront, Orientale boasts three elegant open kitchens, where our legendary chefs serve authentic Asian delicacies. Crust invites guest to customize their own pizza creations with traditional and local ingredients while Cargo, our pop-up diner, serves up gourmet street food amid the lush foliage of our tropical gardens. 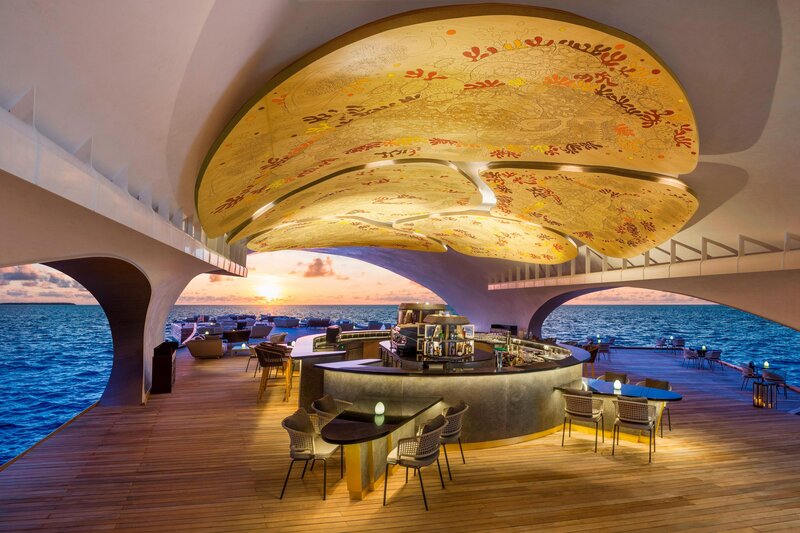 Our whimsical Whale Bar is the overwater destination for enjoying delightful tapas and tantalizing cocktails while watching the sun set on the sparkling waves of the Indian Ocean. Guests are also invited to enjoy bespoke dining options in the privacy of their villa. Inspired by the distinctive flavors and pristine landscape of the Maldives, the Island Mary evokes sunsets on Vommuli Island’s fine white-sand beach, overlooking the glistening Indian Ocean. Our beachfront pizzeria, Crust, invites guests to customize their own pies from traditional Italian ingredients and inventive toppings. Delightful sandwiches and snacks as well as premier draft beers round out our family-friendly menu. Inspired design meets exquisite lighter fare and top-shelf libations at The Whale Bar, our over water lounge. Sip our signature Bloody Mary, or enjoy enticing tapas while admiring the sunset and our resort&apos;s coral reef from our open-air terrace. 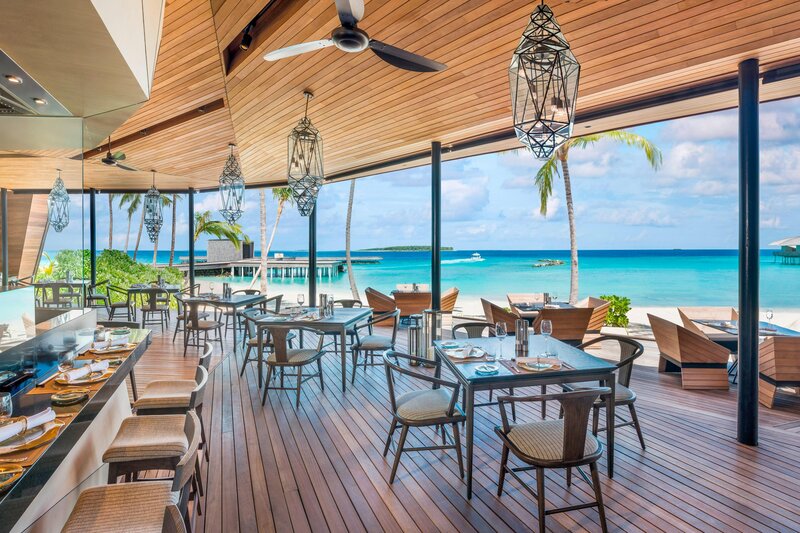 Redefining Eastern haute cuisine, Orientale boasts three elegant show kitchens-a sushi bar, a tandoori grill, and a seasonal pan-Asian section-that open directly onto our white-sand beaches and reveal unfettered views of the shimmering sea. 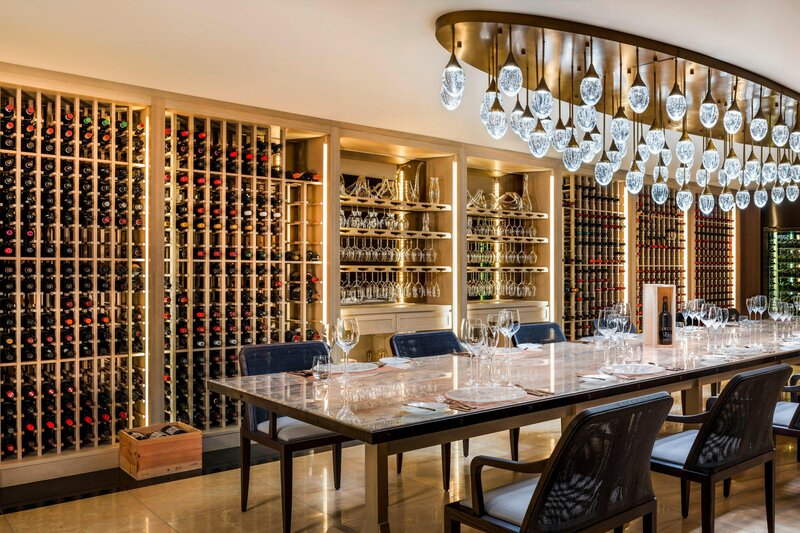 A refined subterranean retreat, Decanter beckons with a five-course degustation menu paired with an inspired selection of prestigious vintages. Our Executive Chef and Wine Director flawlessly craft and present bespoke menus for each gathering. Overlooking our indelible beach and pool, Alba, our signature restaurant, brings modern interpretations of Italian cuisine to Vommuli. Savor palate-pleasing dishes crafted with locally sourced ingredients in our open kitchen on our al fresco terrace. Ensconced by rich tropical gardens, Cargo offers the perfect alternative to beachfront dining. After sunset, our pop-up diner serves gourmet interpretations from the Middle East, which are prepared with the freshest ingredients. Treat your palate to a burst of flavor as you tuck into our hand-made burgers and scrumptious tacos, each crafted to perfection.